Ask people for the qualities critical to success in Leadership, sales and all relationships and communication skills will feature near the top of their list. Ask the same people and they will probably say that they possess great communication skills. However communication skills are a really common issue when coaching senior executives. The majority of conflicts involve problems in communication, either as a cause or an effect. A lack of understanding can result from ineffective communication and can then lead to further communication issues as the level of communication goes down when there is conflict in a relationship. If someone is not performing well in their role it is surprising how there is often a fall in communication between their line manager and themselves. Not only can the frequency of communication reduce in such situations but people also tend to be more guarded in their communication, as the level of trust in the relationship falls. So why do so many people fail to communicate effectively? 1) I’ve not really thought this through, have I? If you don’t know what you mean when you are communicating, how can you expect others to understand you? Poor communicators will not give sufficient thought to what they want to achieve when sharing their thoughts and ideas. If you have an important message to convey it is imperative to spend some time preparing what you want to say and what you want to achieve by saying it. How much time do you currently set aside for this? 2) How can you not understand, this is simple you fool! When you do know what you mean and what you want to achieve, are you sure your audience does as well? Too often we make assumptions that the people we are engaging with have the same level of understanding of the subject matter being discussed and that their perception of a situation is the same as ours. Two simple steps can help here, test people’s understanding of your communication and KISS for the message itself – Keep It Simple Stupid! 3) It’s all about me! It is surprising how many people believe communication is a one way street and is merely an opportunity to impose their views on an unsuspecting world. The language used in these situations tends to be very directive, e.g. you need to…, you should do this…, you have to listen to me…. 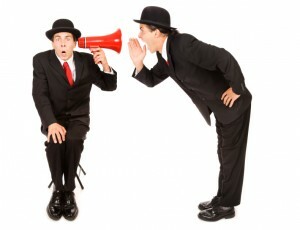 The great communicators place as much emphasis, if not more, on listening as they do talking. If you take the time and trouble to listen to the views and thoughts of others, you learn more and you tend to find they also listen to you when the time comes to share your thoughts! 4) Have you finished yet? It is easy to miss the intended message if you are busy trying to multi task when listening to others. You can’t expect to communicate effectively if you are also reading your email, checking your mobile phone or looking around to see if anyone else is worth speaking to. Not paying full attention to the other person suggests that you don’t regard them as that important. For example feedback from customers about sales people is that the number one complaint they have is the sales person answering a mobile phone when in a meeting with them. As you are reading this, have you checked your phone for messages yet? Take time out and give people your full attention, they may surprise you! 5) I know exactly what you are going to say! There’s no need to let someone else finish talking, you can go ahead and interrupt them as you know what they are going to say, you’ve been there and worn the T shirt and you have a much better point of view. People will become frustrated if you are forever interrupting them, and one outcome will be that they will no longer be willing to share their views and feelings with you. This will lead to one sided communication. Is this what you really want? 6) If only you knew what I really think! Lack of honesty and not sharing how you really feel can lead to a lack of trust in the relationship. People respond positively when they know they will receive clear and unambiguous communication from those around them, even when the message is a difficult one. Respect is given to those who share the truth and the relationship is stronger as a result. Think about those people you know who will tell you the way it is, how strong and trusting is the relationship you have with them? Poor communicators tend to react emotionally and erratically when communicating which can make it difficult for those on the receiving end to anticipate how the communication will progress. This can result in people being nervous around you as they are not sure what type of response they will get and as a result they will tend to avoid opportunities for communication. 8) I’ll give it a miss. Avoiding communication is a common occurrence when a difficult conversation is anticipated. People with low confidence will tend to ignore opportunities to pass on difficult messages with the result that the communication vacuum only serves to increase the size of the problem. The old adage that “no news is good news” doesn’t usually apply in such circumstances as the people on the receiving end of the silence will fill the void with their own perceptions, doubts and fears. If you need to have a difficult conversation and you feel nervous about it, why not practise having the conversation first? No communication is rarely the best option! 9) I’ll just ask for a read receipt. There are various communication routes open to us and choosing an inappropriate method of communication can create further problems. For example there have been stories in the media in recent times of bosses sending redundancy notices by text. On what planet these bosses thought this would be appropriate beggars belief. We don’t need to have every conversation face to face, but consideration should be given to the impact and perception gained from the communication route we choose to use. Poor communicators will often believe that giving people facts about a situation will be sufficient to influence them into following a particular course of action. However as Richard Nixon said, “People are persuaded by reason, but moved by emotion; the leader must both persuade them and move them.” For example a Leader who wants to introduce change needs to back up the logic for change with reasons for others to have the desire to help drive the change. If you want to bring about change what is in it for the people who will be affected by the change? How will they benefit? How will it make life better for them? The above are a selection of common mistakes leading to ineffective communication. I’m sure you can think of others! Why not share them by posting a comment below? When you think about the people around you, how many of the above do they display in their communication with you? How many do you display? About the author: Michael Schofield is an associate lecturer and tutor on Business and Personal coaching courses and undertakes coaching projects for individuals and teams across the UK. He is also a member of the coaching framework for UK Sport and has published the eBook “50 ways to lead your sales team“. Download it on bookboon.com! This article was posted in Articles and tagged communication, leadership skills, Management. Bookmark the permalink. Follow comments with the RSS feed for this post.Post a Comment or leave a trackback: Trackback URL.